Improving the level of cancer treatment by sharing specialised radiation treatment methods. The Tohoku region has very few radiation specialists, one per hospital at the very most, which makes the sharing of treatment methods and clinical case studies an urgent necessity. This led us to start examining the use of communications with high-quality images and sound to link medical institutions in remote areas. Yamagata University is one of the largest universities in eastern Japan, and is also the first university in Japan to establish a "Cancer Center" in their medical school. There are fewer echoes and delays, and excellent sound quality allows comfortable two-way communication. CT data and X-rays with high-resolution images can be shared. With HD Visual Communications, even highly detailed images are beautiful. And because it is easy to hear what the other person is saying, it feels as if you are actually sitting next to them having a conversation. This makes it possible to base the hospital's treatment methods on a wide range of advice instead of having to depend on the judgment of a single radiation specialist. It is expected to further raise the level of cancer treatment. 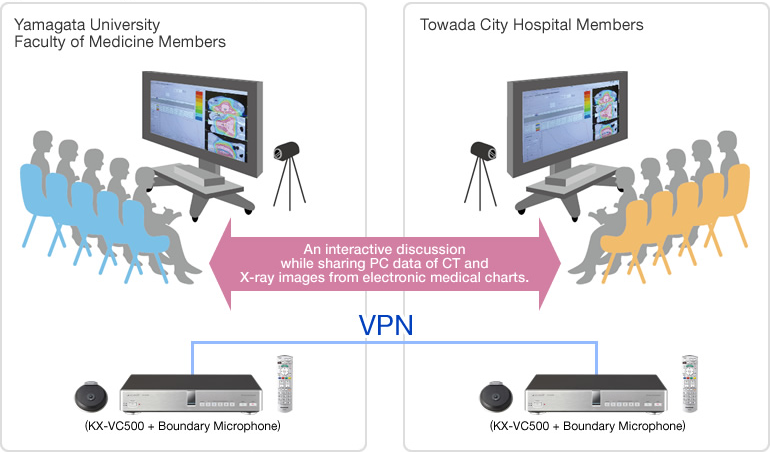 It also allows the dozen or so radiation therapy systems in Japan to be utilised between hospitals while sharing information.